DA Form 2569-R - also known as the "Attorney Of Record Designation (civilian And Individual Military Counsel)" - is a Military form issued and used by the United States Department of the Army. The form - often mistakenly referred to as the DD form 2569-R - was last revised on September 1, 2009. Download an up-to-date fillable PDF version of the DA 2569-R below or request a copy through the chain of command. For use of this form, see AR 190-47; the proponent agency is DCS, G-1. I request that said attorney be permitted to visit me and to communicate with me as necessary in regard to this matter. 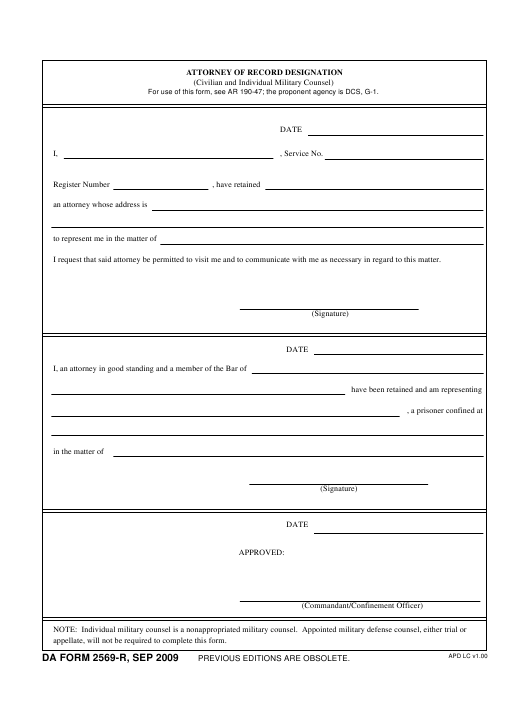 appellate, will not be required to complete this form.